I am home again from my travels to Norway and beyond! I wish I could have posted more of what we had to eat while we were away but the WiFi did not lend itself to much in the way of posting. I had to let my travel and personal blog take over. So here we are just home late last night and I am thinking about what to make on this jet lagged Monday. The best thing about having a set piece for Mondays is that I do not have to think too hard. It’s Chicken Monday! John sous vide the chicken breast and I had mine with with BBQ sauce. Since it is really hot here, I steamed the potatoes and added the broccoli briefly towards the end of the cooking.I made a celery seed dressing for the broccoli and an olive oil dressing for the potatoes. On a personal note, I gained four pounds during the vacation and now I know that I need to make healthful meals at home to counteract all the eating. I loved a lot of the food that we had on our special trip and I do not regret having eaten what I did. There is no point in feeling guilty. 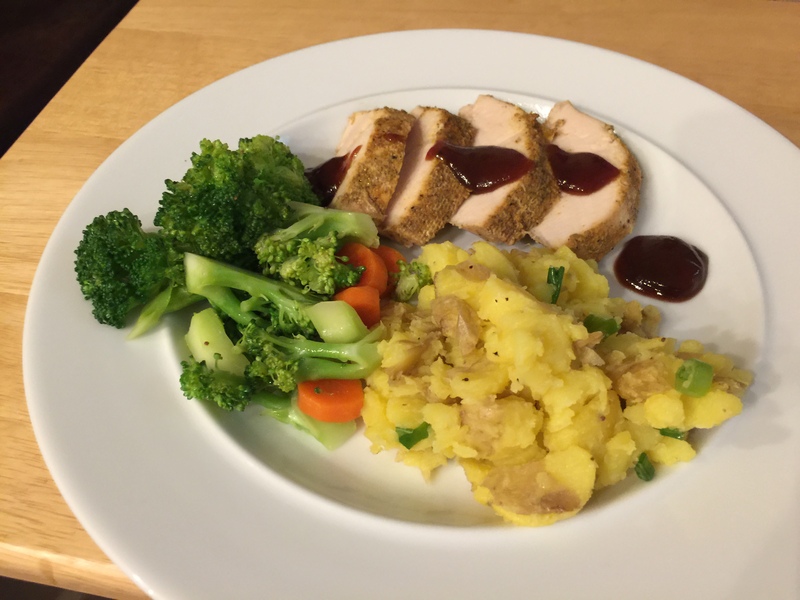 This entry was posted in Healthy tips, Poultry, Vegetables and tagged broccoli salad, chicken breast, Potato salad. Bookmark the permalink.